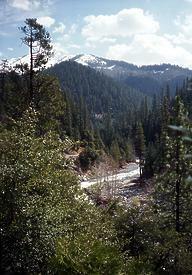 To my knowledge, Coffee Creek (and the West Walker) are the only runnable nine mile rapids in California. 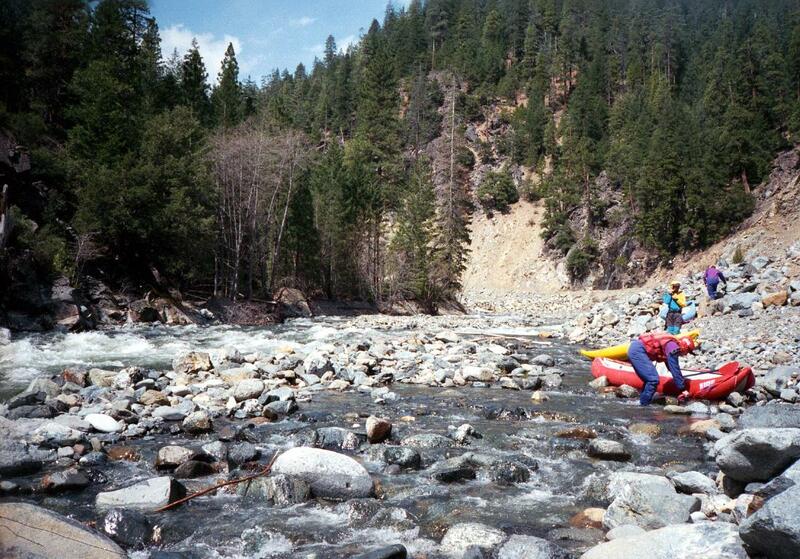 Without the inevitable log jams, this would be like a day of back-to-back Olympic luge rides! Despite the excitement and good scenery however, I'm not sure this run makes it to the classic category. The (single!) 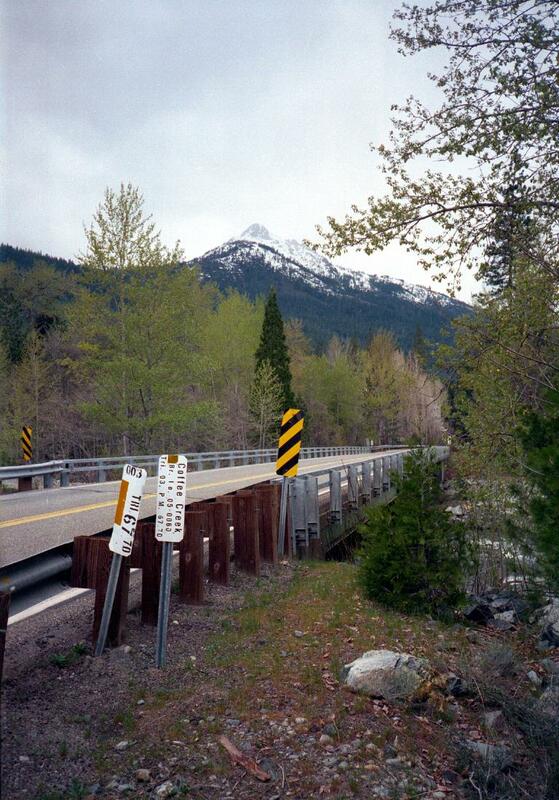 boulder-bar rapid is somewhat monotonous, and the road and houses detract from the edge-of-wilderness feel. Below the USFS boundary, “No Trespassing” signs are everywhere. 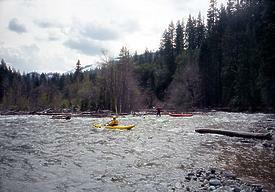 All the same, it's hard to resist running a nine mile rapid. Interesting head-cam video by Wes with good music (by Juno Reactor) here at YouTube. 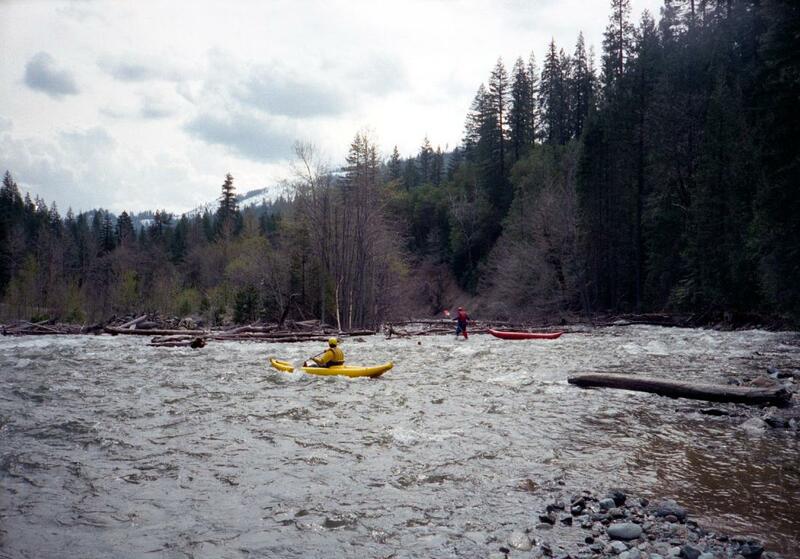 Above our highest recommended put-in at the north fork confluence, rapids are class V and sometimes log-choked, less so recently (2008). One rapid in the final mile has a very hazardous sieve, so watch out. Below the north fork, steep class III begins immediately, and there are some class IV passages. Rapids ease a bit just above the east fork, an alternate put-in. 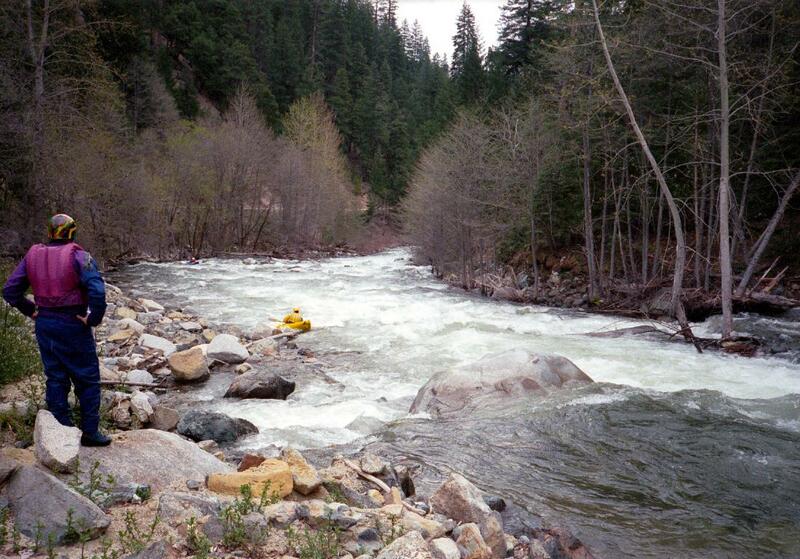 Below there, you might want to stop and scout several blind corners, especially at high flows. Log jams are an ever-present hazard. Two rapids are bonafide perennial class IV: the first is pictured above; the second occurs at a rare bedrock-induced right bend, down near town. 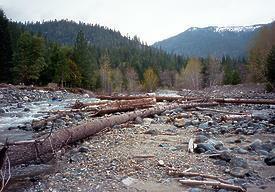 The riverbed gradually widens, and gradient eases shortly above the take-out bridge. Endeavor to avoid taking out before the bridge, because much of the land is private and posted with “No Trespassing” signs. However at one spot shortly below the bedrock-induced right bend, the road comes close to the creek, and we were not hassled taking out there. To reach take-out, drive north on highway 3 from highway 299 at Weaverville (if coming from Redding, going thru Lewiston is a shortcut). At the head of Clair Engle Reservoir, park near Coffee Creek. There is a public right-of-way under the highway bridge. To reach put-in from there, turn left after the bridge, proceed thru the hamlet of Coffee Creek, and continue uphill to either the north fork or east fork confluence.